UPDATE: The Oscars are over. And it's just bizarre to think that one of the most unpredictable Oscars turned into one of the most predicable ever. There just weren't ANY upsets. I got 21 out of 24 correct, only missing out on Best Picture, Editing, and Animated Shore. Ahh best picture to 12 Years a Slave. I was never all that confident in my pick for Gravity winning the top prize. But with it predicted to win a whole slew of prizes it was hard not to also pick it for the top spot. "Slave" walked away with 3 wins including supporting actress and adapted screenplay. Gravity received 7 making it the second most winning non-Best Picture winner, just behind "Cabaret"'s 8 wins in 1972. Overall it was a great show and Ellen was a great host again. 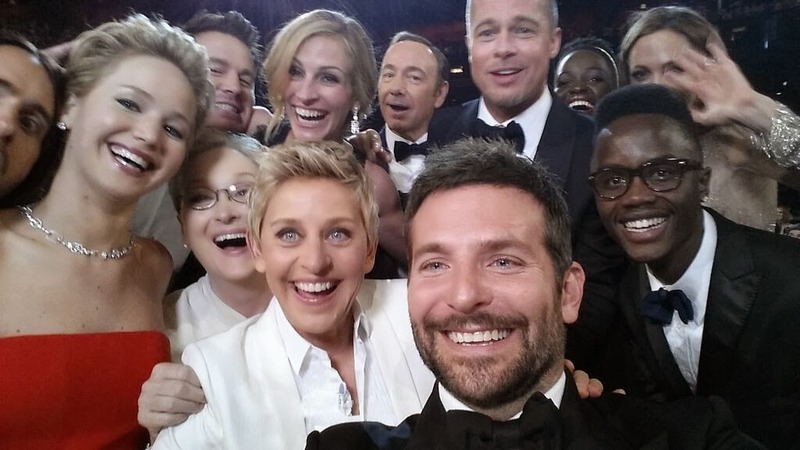 Her epic selfie and pizza stunt will certainly go down in history as some of the more memorable recent Oscar moments. Who Will Win: “Gravity.” I seriously have no clue. My gut is telling me to go with “12 Years a Slave.” It will probably win actually. And to be honest I’m not predicting “Gravity” because it’s my favorite… I’m picking it because the Academy rarely splits the Directing and Best Picture prize and they’re usually unpredictable. So if I were to predict “Slave” I’d have to predict Steve McQueen which feels foolish. Besides can “Slave” really only win Best Picture and only 1 or 2 more awards while “Gravity” is practically guaranteed at least 6 or 7 awards? Seems silly to bet against it in all honesty. Who Should Win: “Gravity.” My favorite film the year hands down. It’s a cinematic masterpiece. It’s the ultimate movie-going experience. It’s thrilling, beautiful, emotionally satisfying. It’s everything you want in a movie. I just can’t get enough. Will Win: Alfonso Cuarón, “Gravity.” I’m pretty confident here as most people are. Cuarón has crafted a truly special and unique cinematic masterpiece. And he has the DGA award to boot. A win for anyone else would be a legitimate upset. Should Win: Alfonso Cuarón, “Gravity.” What a truly remarkable film. I’d vote for him 10 times if I could. Will Win: Matthew McConaughey, “Dallas Buyers Club.” Alright alright alright, indeed. McConaughey has been a strong force in the pre-Oscar awards and there’s no real reason to think he can’t go all the way…. Except that, this a disturbingly strong year for male lead performances, and with the exception of maybe Christian Bale any of these could actually win here. A lot of people are behind DiCaprio, and with good reason because he’s amazing as well, but how many voters truly loved “The Wolf of Wall Street?” Ejiofor is a possibly spoiler if “12 Years a Slave” ends up being a surprise sweeper. If he were to win, the film would definitely win Best Picture. But my money is still on McConaughey. Just barely. Will Win: Cate Blanchett, “Blue Jasmine.” Logic would say Amy Adams would be the frontrunner since she’s the only one nominated here who hasn’t already won, but Blanchett has been an unstoppable force all season long and nothing can derail her now (not even a controversial smear campaign against Woody Allen and his film). Should Win: Jared Leto, “Dallas Buyers Club.” I absolutely loved this film and thought Jared Leto was phenomenal. Will Win: Lupita Nyong'o, “12 Years a Slave.” This will be the category to watch. I honestly don’t believe that “12 Years a Slave” can win Best Picture without scoring here as well. Could it honestly win Best Picture and Best Adapted Screenplay and not take this too? But there’s the Jennifer Lawrence factor. Everyone loves her and she’s the scene-stealer of American Hustle and with four nominations it’s got win one of them right? And there’s the fact that SHE JUST WON LAST YEAR. Lupita has the edge, but barely. Should Win: Jennifer Lawrence, “American Hustle.” Jennifer Lawrence was easily my favorite part of “American Hustle” an otherwise sprawling, slightly too long and mildly perplexing film that I didn’t absolutely love but really wanted to. Will Win: “12 Years a Slave.” Here is where things matter. “12 Years a Slave” is easily the frontrunner here and if it misses, there’s no way in hell it’s taking the top prize. If it does miss expect a win from either “Philomena” or even “The Wolf of Wall Street.” Heck, even “Captain Phillips” surprised and won the WGA award. Will Win: “Her.” I’m very conflicted on this one. It’s a neck and neck race between this and “American Hustle.” The latter could easily, and actually probably will, win this but the Academy is known for rewarding offbeat truly original works in this category so “Her,” also a Best Picture nominee, would be no exception. Although, the prospects of finally being able to reward David O. Russell may be too strong to ignore. Flip a coin, really. Will Win: “Frozen.” The first of two assured wins for “Frozen.” I honestly can’t imagine something else winning, though “The Wind Rises” and “The Croods” has its fans. It must be noted that, shockingly, Disney Animation has yet to prevail in this category. Will Win: “Gravity.” One of the surefire victories for “Gravity.” The Academy has no doubt been kind to films shot in 3D or with significant use of computer animation. How long before this category gets split into Best Traditional Cinematography and Best CG Cinematography? Will Win: “The Great Gatsby.” Like with Production Design, I wonder if people even really like this movie enough to vote for it. It’s the most obvious nominee, though there’s actually a British costume drama in play (The Invisible Woman) which isn’t a widely seen or known film. I could easily the flashy 70s garb of “American Hustle” taking this though it feels a bit too modern to go all the way as this category is notorious for rewarding films set way, way in the past. Will Win: “20 Feet From Stardom.” Another real toss-up. The controversial “The Act of Killing” has dominated most of the early awards, but I’m wondering if the harsh subject matter will turn voters off (not to mention the subtitles). The heartfelt doc about backup singers “20 Feet from Stardom,” although ultimately a bit lightweight, is the feel-good film of the otherwise gloomy bunch of nominees. Will Win: “The Lady in Number 6: Music Saved My Life.” It’s about a Holocaust survivor. Enough said. Will Win: “Captain Phillips.” This is one to watch. If “12 Years a Save” is supposedly going to win Best Picture, it’s gotta win at least one tech award and it’s hard to think "Gravity" will win most of them and then not just go all the way. But “Gravity” is known for some very long takes, which doesn’t exactly highlight the film’s otherwise tight editing. “Captain Phillips,” however, is an editing showcase. It’s a prestigious “action film” and best picture nominee helmed by the guy whose films “United 93” and “The Bourne Ultimatum” were nominated here, the later actually winning. Will Win: “The Great Beauty” (Italy). This one really is a toss-up. Academy members are no longer required to attend screenings of all five films before voting so it’s possible the most “popular” film could take it… of course, determining which one that is exactly is tough. “The Great Beauty” won the Golden Globe which helps and Italy has a particularly strong track record in this category. Will Win: “Dallas Buyers Club.” I think Academy members would just feel embarrassed voting for “The Lone Ranger” or “Bad Grandpa” however deserving they would actually be. It’s hard to bet against Best Picture nominees in these tech categories. Will Win: “Gravity.” The music branch is notorious for nominating the same people whether they’ve won before (ahem, John Williams) or not (ahem, Thomas Newman). The overall Academy has a strong track record for rewarding first timers in this category and there’s no reason to think they won’t do the same this year for Steven Price’s powerful, electronic “Gravity” score. Will Win: Let it Go, “Frozen.” Disney once dominated this category. The last time a non-Pixar Disney film won was for 1999’s “Tarzan.” And they’re back in the saddle again with this delightful and powerful song that is sung in a pivotal point in the Animated Feature frontrunner “Frozen.” I’d genuinely be surprised if anything else won. Will Win: “The Great Gatsby.” I’m concerned the lukewarm reception of “The Great Gatsby” will hurt its chances but it’s definitely the flashiest of the nominees. They could easily give it to a film they simply liked better like “American Hustle” or “12 Years a Slave.” I’d love to see “Gravity” take this one, if it does it could be an early indication that a “Gravity” sweep is coming. Will Win: “Gravity.” Remember that random tie between "Skyfall" and "Zero Dark Thirty" last year? Wow crazy stuff. Action films and war films do amazing well in this category so I could easily see something like "Lone Survivor" or even "Captain Phillips" triumphing. But “Gravity” is such a unique and celebrated film it’s definitely the frontrunner. Will Win: “Gravity.” The sound design of “Gravity” is such an amazing accomplishment it should easily triumph here. It’s possible the musically charged “Inside Llewyn Davis” or the gunfire heavy “Long Survivor” could upset but don’t bet on it. Will Win: “Gravity.” Easily the safest pick of the evening. If anything else wins, I’ll gladly eat my own feces.